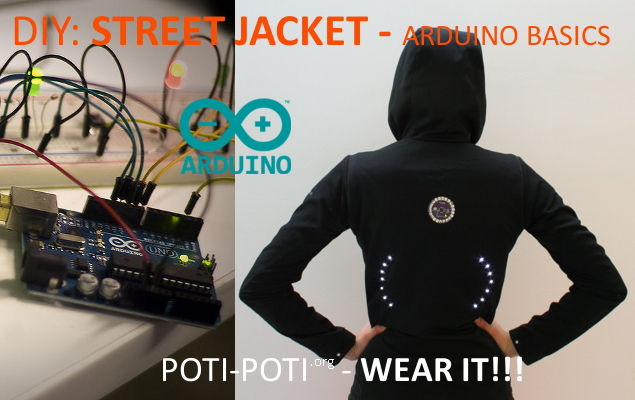 DIY: ARDUINO STREET JACKET (5h) is a workshop for individuals wanting to get started into the universe of the physical interactive devices through the Arduino platform by developing a full hands-on project. To put into practice the knowledge acquired during the ARDUINO course (UNIT 1: ARDUINO BASICS), in this workshop you will make your own Street Jacket. Street Jacket is a smart wearable for bikers that makes you more visible at night and helps others to know where you are going by blinking groups of LEDs embedded in the clothing. Street Jacket is a project inspired on Leah Buechley’s instructable (http://www.instructables.com/id/turn-signal-biking-jacket/). During the course, other than learning how to work with the Arduino platform, you will be introduced to tissue-embed electronics. These, coupled with the emerging scene of new materials (conductive, chromic, light diffusing, etc. ), will probably rise as one of the main branches of the pervasive computing and the Internet of Things. Bring your jacket, learn open-source electronics and be fashionable when biking! OBJECTIVE: Introduction to Arduino, physical computing and weareables. Put into practice all the knowledge acquired during the ARDUINO BASICS workshop. TARGET AUDIENCE: Designers, artists, architects or anybody willing to get started into the universe of the physical interactive devices. No previous knowledge of electronics or programming is required. WORKSHOP MATERIAL: You will need to bring your own jacket or sweater and your own laptop with Arduino IDE installed (http://arduino.cc/en/Main/Software). You should also download Ardublocks (http://blog.ardublock.com/engetting-started-ardublockzhardublock/). All the electronics kit used during the workshop will be provided. Prior knowledge and experience: It is mandatory to have attended ARDUINO BASICS workshop.